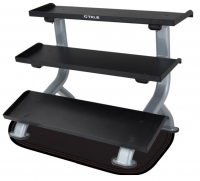 Three sided formed trays creates added strength and securely holds any size dumbbell or kettlebell. Bent tube construction enhances the premium aesthetics. Built-in transport wheels for easy roll away. Solid steel bar dividers prevent weight plates from sliding off. Built-in two 2-inch diameter Olympic bar holders. Six 8-inch weight prongs. 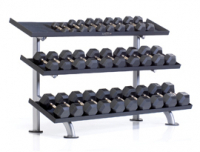 Two-tiers hold 10 pairs of regular size dumbbells. Pro-style with individual rubber saddle. Fit any dumbbell grip size 4-1/4". 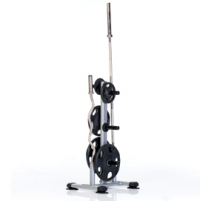 Ideal for hex-type dumbbells and for most regular size dumbbells. Top tray 16" deep; bottom tray 18" deep. Holds ten barbells horizontally. Stainless steel bar catches with protective guard. Three-tiers hold 15 pairs of regular size dumbbells. Pro-style with individual rubber saddle. Fit any dumbbell grip size 4-1/4". 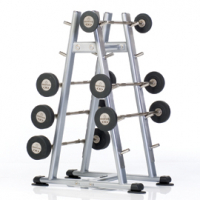 Ideal for hex-type dumbbells and for most regular size dumbbells. Top two trays 16" deep and bottom tray 18" deep. Two Olympic bar holders. 6-prong plate holders. Does not support bumper plates. Olympic bars and weight plates not included. 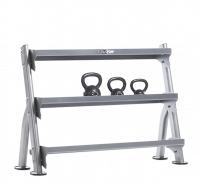 Universal tray-style design easily converts from angled to flat position to hold standard dumbbells, hex dumbbells or kettle bells.